This weekend I got to visit a place of historical significance in LA where I'd never been. I've seen the church called The Onion probably hundreds of times. My high school was right down the street. But I'd never gone inside. Then I was invited to speak and sign books at a meeting of the Los Angeles Conservancy. The group's currently celebrating the 1960's. And the members voted the Onion as their favorite example of Sixties ecclesiastic architecture. That's an obscure category, but a good choice. From the street the church looks a little like a Bermuda onion sitting upright on the ground. It was designed by a student of Richard Neutra, the famous modernist. In many LA architecture guides, it's the only place of interest in the middle of the Valley. They call the area North Hills now – the result of some creative image fixing several years ago. It used to be just Sepulveda. And the old name does just fine for The Onion. If you query Google for the phrase Sepulveda Unitarian Universalist Society, you get more than 39,000 hits. Only a few of them even mention the event that piqued my desire to visit. It happened on a February night 34 years ago. 1966 was the year after the destructive riots in Watts. Up in San Francisco, a band of psychedelic heads called the Merry Pranksters came up with an idea to heal the wounds in Watts with music -- and free LSD. Their bus stopped first at The Onion, where the pastor was a friend. The Pranksters brought along some other friends, like the Grateful Dead and Neal Cassady, the beat poet. Accounts disagree on just how much tripping went on. But - let's put it this way. The occasion's known in Sixties lore as the First Los Angeles Acid Test for a reason. Ken Kesey, the leader of the Merry Pranksters, missed the party. He was in Mexico. Writer Tom Wolfe wasn't at The Onion either. But he reconstructed the scene in a book, The Electric Kool Aid Acid Test. The book became an important chronicle of that era. And a noted early example of the writing style called the New Journalism. I can't honestly say that the ghosts of that night were present on Saturday afternoon. 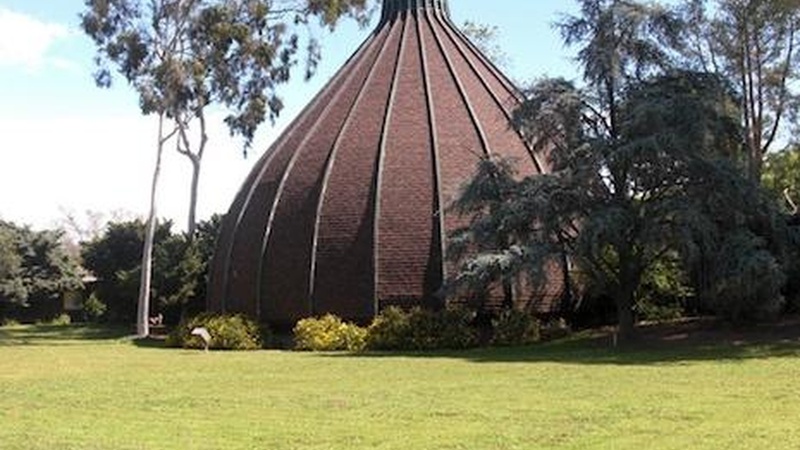 The Onion just looks like what it is -- a sanctuary for the congregation and a community gathering place. The Conservancy folks didn't strike me as an acid-dropping crowd. But they did seem entertained by my little glimpse of local color. I told them how the Valley's endless bland subdivisions are actually a hotbed of Sixties lore. On the first summer weekend in 1969, the suburbs were overrun by waves of longhairs and hippie chicks. They poured in for an outdoor festival headlined by Jimi Hendrix and a bunch of other acts that would show up at Woodstock later in the summer. It's the kind of cultural history and lore that survives with or without the buildings that the Conservancy honors and saves. But it's sure nice to have places like the Onion to bring the stories to life. You're invited to share your memories of the 60's in LA at KCRW.com/LAObserved.